Anytime dining offers flexibility, with the same freedom as land-based nights out. Show up in the designated dining room whenever you feel like it, between 5:30 p.m. and 10 p.m., to free yourself from the "hurry up and get dressed for dinner" rush that all too often comes after a long and active day in port. 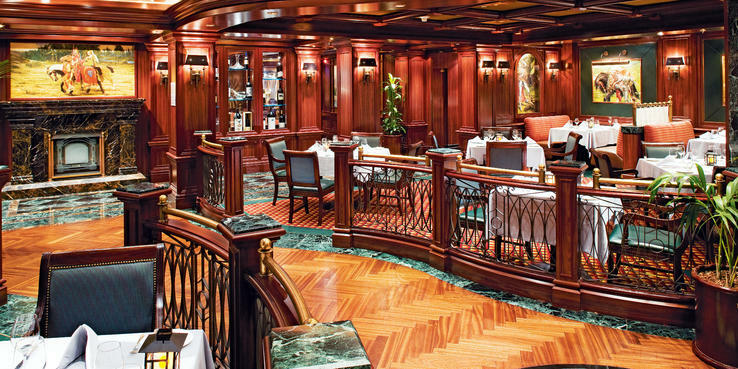 Because of the popularity of anytime dining, the ship utilizes both the Bernini dining room from 5:30 p.m. until 10 p.m. and the Donatello from 7:30 p.m. onward. If you're willing to meet new people and join a group table, then you could be seated more promptly. But, if you desire a solo table during the popular 7:45 p.m. to 8:30 p.m. slot, you might wait up to 15 minutes. The dining room host will hand you a pager that will buzz when your table is ready. By arriving around 7 p.m., we were able to finish our meal in time to double up on our evening entertainment, taking in the first show at the Princess Theater at 8:30 p.m., followed by the comedian or singer in the Vista Lounge at 10:15 p.m., with enough time left over to throw away our quarters in the casino's slots. Tip: Reservations for a specific time for any size group, even for a couple, can be made throughout the cruise. Traditionalists who like the camaraderie of the same table and service from the same waiter -- the one who knows you like extra lemons with your iced tea -- can book tables for the traditional dining plan in the Canaletto dining room for either 5:30 p.m. or 7:45 p.m. service. Despite seating hundreds of people at once, the dining rooms don't feel cavernous. Railings divide the rooms into manageable areas, and the drapes, carpeting and other measures absorb much of the background noise, so you don't ever have to yell to be heard by your tablemates. Each dining room is its own enclosed room, rather than a tiered multi-deck space. The decor is lovely and floral, with paintings of country gardens. Each night, diners have a choice of two pastas, appetizers, soups and salads, and main courses. Vegetarian items are marked on the menu. Always-available selections include Caesar salad, shrimp cocktail, broiled chicken breast and grilled beef medallions. An adequate selection of wines, ranging from $20 to $50 per bottle, is available. Open-seating breakfast (7 a.m. to 9 a.m.), lunch (noon to 1:30 p.m.) and afternoon tea (3:30 p.m. to 4:30 p.m.) are also served in the Donatello dining room. A nice touch is that late-riser's breakfast items, such as corn flake crusted French toast, are always included in the dining room's lunch menu. The Horizon Court serves buffets on Deck 14, with the stations all contained in one small area, so you're never in danger of overlooking food options. Breakfast, from 6 a.m. to 11 a.m., features the usual array of hot and cold cereals, smoked fish, scrambled eggs, omelets, and alternating days of waffles, pancakes and other traditional fare. For lunch (11:30 a.m. to 3:30 p.m.), in addition to cold cuts, the spread includes a hot fish, chicken or pork dish (often all three), vegetables, greens and, sometimes, special platters like sushi. For dinner (5:30 p.m. to midnight), the Horizon Court also offers a variety of hot and cold entrees, along with salad and desserts. For early risers, a continental breakfast is served from 5 a.m. to 6 a.m.; those looking for a post-lunch snack can grab something between 3:30 p.m. and 5:30 p.m. When it's not busy, one side or the other is shut down; we rarely had to wait in line, but we did struggle finding a table. The staff, however, keeps an eye out for this and efficiently ushers people to open spaces. The selections for breakfast and lunch there are heavy on the carb and sweet side, so if you're looking for some leaner options or protein, Donatello might be a better option. Horizon Court will undergo a complete overhaul as part of the ship's refurbishment, scheduled for early 2014. The area will be opened up, providing more space and better flow. The dining options continue out by the Calypso Reef pool, where chefs toss pizzas at Prego Pizzeria (open 11 a.m. to 11 p.m.) and grill up burgers and dogs at the Trident Grill (11 a.m. to 11 p.m.). We loved swinging by Trident Grill for a midday snack and delicious French fries. Vegetarians be warned, though: While a "veggie burger" is offered, you'll probably be surprised when you're handed mashed potatoes mixed with peas, carrots and broccoli formed into a patty and put on a bun. Satisfy your sweet tooth with soft-serve ice cream and all manner of sprinkles at Sundaes Ice Cream Bar. The International Cafe, located on the Piazza, is another casual dining option. Open 24 hours, it serves complimentary snacks, including breakfast pastries, soups, quiche, salads and desserts. (Think warm, melty cookies, as well as fancier items.) We enjoyed the prosciutto, mozzarella and chicken breast sandwiches. Specialty coffee drinks cost extra. It's quite pleasant to grab a seat in the atrium, munch on your snacks and observe whatever entertainment is happening in the Piazza (or simply people-watch). Next door, Vines Wine Bar (11 a.m. to 11 p.m. or 4:30 p.m. to 11 p.m. on port days) serves up complimentary sushi and tapas with the purchase of a drink. Its corner of the Piazza is like stepping into a traditional winery with oak barrels for tables and flooring that looks like tiled stone. Pair your meal with a great glass of wine, or try one of several reasonably priced wine flight options. Golden Princess offers two specialty restaurants: Sabatini's and Crown Grill, available by reservation only. To get the time and day you desire, reserve well in advance. Dinner is served in both venues from 5:30 p.m. to 10 p.m. If you like Italian fare, don't miss Sabatini's, a steal at the $25-per-person extra charge. Our favorites included the buffalo mozzarella (essentially, a big old hunk of fresh cheese), fried calamari and lobster three ways. The menu is heavy on seafood, but the staff is willing to tweak items to keep those who don't eat fish happy. Pasta is, of course, wonderful, and our waiters sang to us as they added Parmesan and fresh-ground pepper to our plates. By the time we licked the last of the tiramisu from our forks, we were stuffed and very happy. The Crown Grill has a more traditional vibe. A New York-style steakhouse, its ambience is set with black-and-white photos of New York City, red woods and carpeting paired with blue upholstered chairs. The menu focuses on seafood, chops and steaks, with the additional choices of appetizers (black tiger prawn and papaya salpicon, lobster cake), soups and salads (black and blue onion soup, marinated goat's cheese and heirloom tomato salad) and the delectable sides that always crop up in steakhouses (garlic fries, mashed potatoes, creamed spinach). The fee for a multicourse dinner is $29 per person and $14.50 for children ages 3 to 12. Room service, although limited to a set menu of breakfast items (pastries, coffee, fruit) or sandwiches, salads and burgers, is available 24 hours a day. Ultimate Balcony Dining proved an incredible in-cabin experience. Our personal "butler," after draping our balcony table and chairs in yellow linen, began our experience by offering us Champagne and canapes. Then, the ship's photographer snapped our complimentary photo. Next, we dined on our balcony, enjoying the seascape, the swooping gulls and the breezes as our butler served us, course by course, discretely positioning himself behind the cabin drapes or out in the hall when not needed. The food was good and bountiful. We started with blue crab in pastry shells, followed by salad, then lobster tails and filet mignon ... and for dessert, walnut and vanilla mousse, plus chocolates. The meal was both romantic and memorable, and though an indulgence at $100 per couple, it was well worth the extra splurge.